The wrestling team finally got around to the home portion of the schedule on January 23rd, hosting Lancaster and Westwood in the final matches of the region slate. The first match of the night against Lancaster was very exciting, a back and forth affair that came down to the final match, hoping for a 42-42 tie that we could win on tiebreak criteria. Unfortunately, Lancaster was able to get just enough out of their lineup to emerge with a hard fought 48-36 victory. This match was the best and toughest the team has wrestled, top to bottom, all season and is obviously due to the new Penn State-inspired singlets that the team was able to break out! Key performers against the Bruins were: Jabari Hampton, Joshua Williams, Ben Maco, Janio Cespedes, Aaron Wright, and Brandon Holliman. In the final match of the evening against Richland 2 foe Westwood, the team got out to a fast 36-12 lead due to a handful of forfeits and Michael McQueen getting us started with a pin. 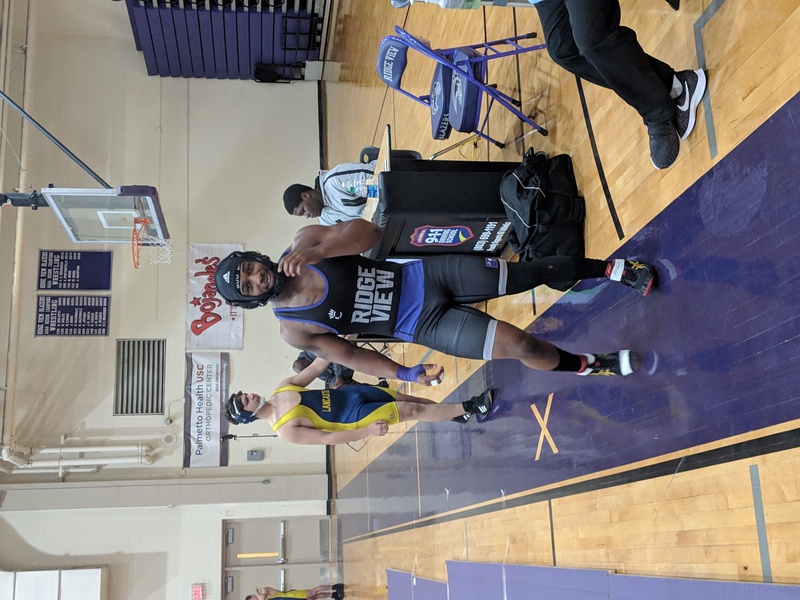 Roman Robinson and Jabari Hampton iced the match by getting us to 2 more pins later in the match and the Blazers were able to finish 4th in the Region with a 48-36 victory. FUN FACT: The Blazers went undefeated against Richland 2 teams this season with a 3-0 record (Blythewood, RNE, and Westwood). The team is now waiting to see if they qualify for an at-large playoff bid next weekend. The next competition for the team will be this Saturday at South Pointe in the Region 3-4A individual tournament as we look to qualify as many individuals as possible for the Upper State tournament in February, and eventually the State Tournament for the 3rd year in a row! The Blazers will host 2 more matches next Wednesday to close out the regular season against Heathwood Hall and Mid-Carolina. The team is currently 10-14 overall and is excited to wrestle in February.